This is a very important meeting. Board members are elected, budgets are set as well as priorities for the organization. The meeting is open to the public. Dr. Darnisa Armante will be our Special Guest and will lead a discussion centered on the Triplets of Evil – Racism, militarism and poverty as articulated by Dr. Martin Luther King, Jr. which will explore the intersectionality of these three evils and ways we can work to build economic and racial equality, and confront the misplaced priorities of the military industrial complex. 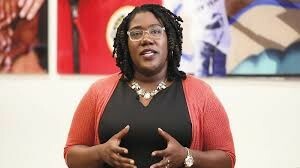 This is an opportunity for the NHPA membership to learn from Darnisa’s powerful perspective gained through her work with the Disruptive Equity Education Project (DEEP) and other racial equity and anti-racism work she is involved in. This will be a potluck luncheon, business meeting and networking event. Suggested donation is $20, preregistration is appreciated. Please contact Doreen at doreen@nhpeaceaction.org or 603-228-0559 to request a waiver.